"Creativity arises out of the tension between spontaneity and limitations, the latter forcing the spontaneity into the various forms which are essential to the work of art or poem." Painting with reference images from interior design magazines... drawn in pencil and painted with gouache. I woke up early yesterday with an achy jaw after unpleasant dental work the day before. So as I sat at the breakfast table drinking leftover coffee waiting for the Advil to kick in I decided to try to paint some pages from a magazine like Architectural Digest or Elle Decor. I looked through the magazines for a living room but the green shutters in the bathroom photograph caught my eye. The photo is of a bathroom in a house in Chile. I didn't want to draw the full page in portrait format, just way too big, so I drew a vertical line down the middle to make two smaller portrait style spaces. 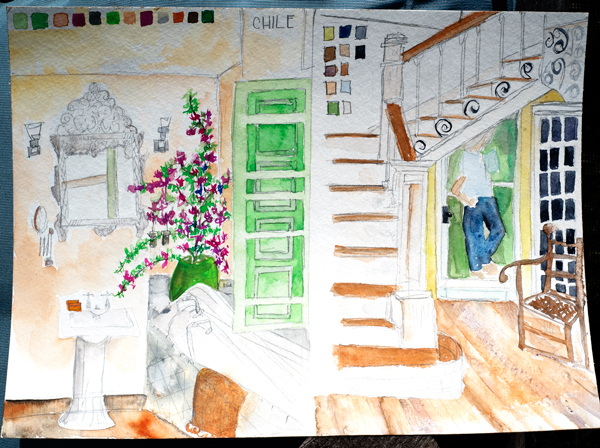 Anyhow, I started with the green shutters and then built out the room in pencil from there. My nemesis is definitely perspective. The tub probably wouldn't hold water! This was really an interesting exercise - I usually draw in pen - but I didn't want the pen bleeds in the finished pages - I wanted the lines to be softer. But I didn't use an eraser - they just frustrate me - if a line didn't work I drew another better line and when I painted just ignored the lines that didn't make sense. So then I paged through a magazine and selected the foyer with the rustic white stairs. I think what pulled me in was the composition and the painting on the door under the stairs. I started drawing the second one with the diagonal line of the stairs and built the page out from there. 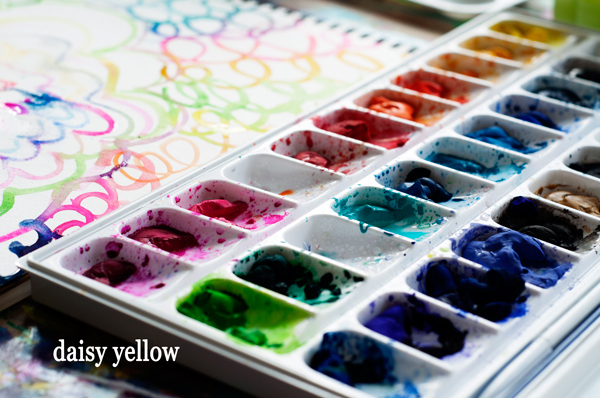 As for painting, I really got into mixing colors, especially colors I don't often use. Really got my mind thinking! Like to make the taupe-terra cotta-sort of color for the bathroom wall I mixed sepia, scarlet and white! I just love gouache. So full of wild opportunity.